The Importance Of Grandparents In A Child's Life Can Never Be Underestimated...Here's Why! Grandparents are an integral part of the family structure and their presence is invaluable when it comes to raising children. They play a significant role in shaping their grandkids' personalities by offering unconditional love, life lessons and life experiences, and sometimes even by spoiling them. Grandparents are able to fill in a gap that overworked parents are unable to. 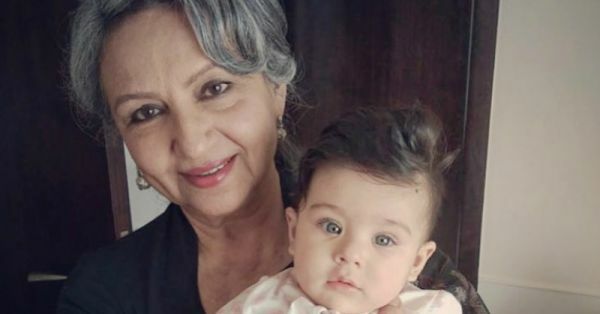 In fact, grandparents play an even bigger role for single parents by not only providing a safe haven for the kids but also taking on a huge responsibility of almost raising kids again. 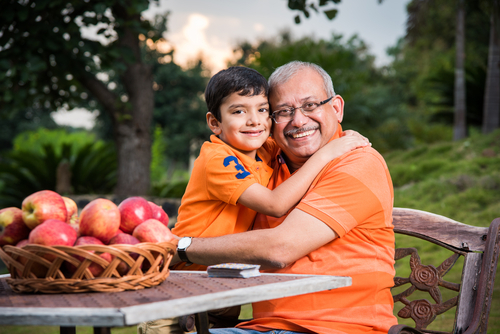 The importance of grandparents is undeniable when it comes to being involved in their grandchildren’s lives, so let's read further to know how they enrich their grandkids' lives. Parents have a demanding life now and are unable to constantly be there for their children. Especially with mothers taking an active part in the workforce, children are increasingly spending time with caretakers. Small children are sometimes unable to express their feelings and frustrations clearly and that manifests into behaviour which is deemed unacceptable by most. This is where grandparents can provide essential support and stability in a child’s life. It is seen that kids who spend quality time with their grandparents can manage their emotions better as compared to children don’t. So if you want children to grow up as happy individuals, have them spend more time with their granddads and grandmoms. It is seen that, regardless of the type of families, kids who spend time with their grandparents tend to display empathetic behaviour. With years of experience behind them, grandparents can teach so much to their grandchildren. By telling them their experiences from similar difficult situations that they may have gone through when they were the same age, grandparents equip their grandkids to deal with life better. Believe it or not, my in-laws have a busy social calendar. Being involved with various social commitments and associations gives them the opportunity to mingle, especially because they have more time to do so. Being an active member of a social group allows them to interact with new people on a daily basis giving them a sense of community. I honestly believe my kids need to learn the feeling of being part of a community which they see and imbibe as they attend a few cultural festivals celebrated by them. When they see their grandparents take an active part in such gatherings and celebrations, it makes my children want to be more outgoing and socially active. Going through old family pictures is so much fun, right? Imagine doing this with your parents and children together as a family? Grandparents are a window to the times gone by. 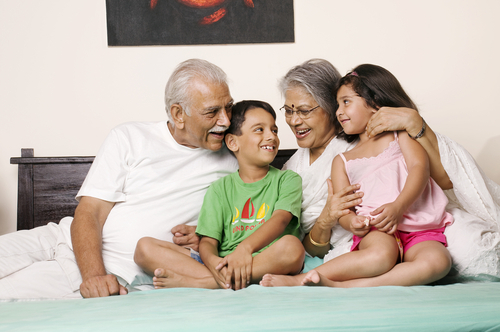 Grandkids can get a peak into the time their parents were kids and listen to their funny stories of them. It is almost like a taking a history lesson about your family. This, in fact, also helps the grandparents as it makes them remember happier times. It’s a great way to enhance the bond between grandparents and grandkids as one gets to tell stories they may or may not have told anyone before. I wish I had learnt how to cook my from my nani. 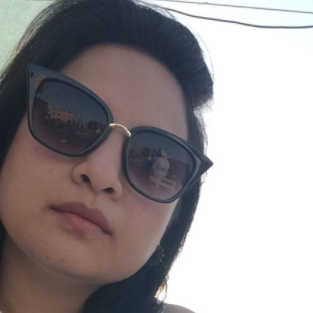 She was one of those instinctive cooks who could never go wrong with food. I have a distinct memory of how the kitchen just erupted with delicious aromas when we visited her. Unfortunately, I never got around to that. But here’s what I learnt. Grandparents, today, have seen the world change into what it is today and they possess skills that we don’t. Things like sewing, knitting, simple methods of baking or writing a letter are dying and they no longer get passed on. Learning from grandparents is a way to keep their legacy alive. According to experts, when grandparents spend time with their grandchildren, they also benefit from it in the following ways. Young children have a lot of energy and need to exhaust it, grandparents on the other hand need some form of exercise both mental and physical. This can be achieved when grandparents babysit their grandchildren. 1. Current Events: Sometimes, kids are the window to the outside world. 2. Technology: Grandparents who are not so tech-savvy can learn a great deal about the latest technology from them. Learning new things gives the grandparents a huge mental boost. 3. Self-Reliance: Children want to do things themselves and continuously learn new things and this is a great lesson in self-reliance. The elderly give up as they get older and stop learning. But to have a quality life, one needs to keep reinventing and grandparents can learn this from their grandkids. This for those sunny-wintery morning. Pack a picnic and head to the nearest playground. You will love the outdoors and your parents will love you more for bringing them out of the house. Put on their favourite song and encourage your toddlers to dance with them. It will bring back so many memories for them and the much needed exercise for those aching joints. But it will bring a bigger smile to their faces and pure joy to their heart. Ask your parents to teach your children something they learnt as a kid or a teenager. It will jog their memories and activate their brains and your kids will learn something completely new. The elderly usually have a set schedule during the day. They love spending time doing things that brings them joy. Be it gardening, playing cards, or singing or playing a musical instrument, see what interests your kids and try to get them to join in. Find an old photo album and get your kids to sit with their grandparents with that open. This session will be like walking down a memory lane. 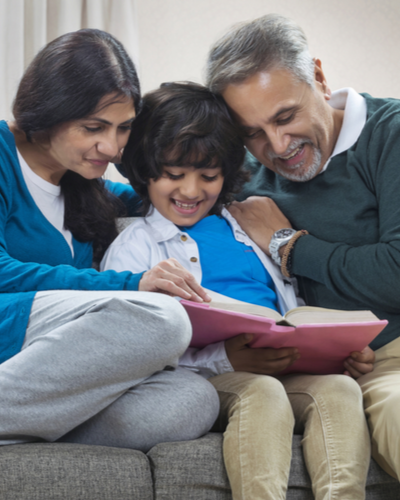 If your kids share a love for books with your parents, try getting to read something together. Or, pick a book that they read as kids that your young ones can now understand. It will like your own in-house book club which will never fail to amaze you. They are old and will need help doing a lot of things. Your kids can help in everyday chores and make life a bit easier for them. Remember Ludo, Carrom board, snake and ladder are great family games that help your have fun and bond at the same time. Parents can be mutual beneficiaries. With increasing parenting responsibilities, parents forget spending time on themselves and with each other. This takes a huge toll on their relationship, especially when living in a nuclear setup where one can’t catch a break. Grandparents can help a great deal here by stepping in and giving some alone time to the parents who can use this time to invest in themselves and the relationship, so it's a win-win for all. So, give it a try and see both the grandparents and the grandkids blossom in each other's company.